Entries categorized "Japan Spring 2008"
As we take the train ride to Osaka City, we can see that Sakura blossoms are still in full glory. We are staying across the river from the Osaka Castle This is one of the favorite spots for people to set up picnics along the river after work and enjoy the evening. 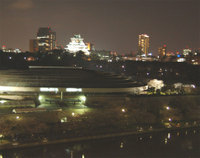 The large flying saucer building is a concert hall and behind it is Osaka Castle. This is the view from our room on the 9th floor at the The New Otani Hotel. There was a time not so long ago that the Castle was the skyline, today we see many new office and living buildings making the Castle appear much smaller than it really is. We are tired but very excited to be back in Japan. We have a FULL itinerary including tea gardens several tea cultural sites, of course Sakura and Onsens but also since we will be joining our friends who are both artists and art lovers for a couple of days we are going to get an inside peek of some of the local art as well.